Stocks are swooning in October once again, but that's no reason to panic. It may not be Halloween yet, but the haunting of October has come a bit early for investors. 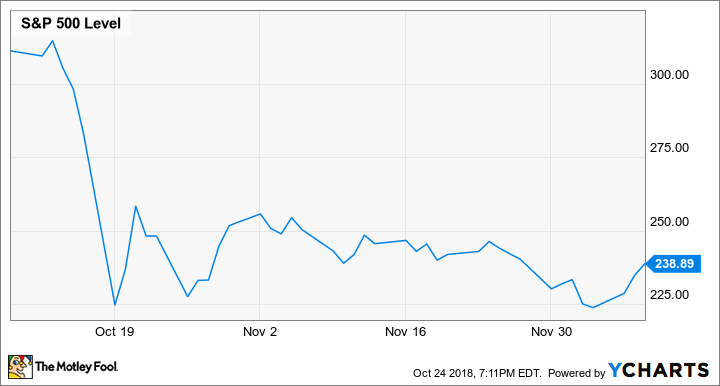 Historically known as a rough month for the market, October has been a month dominated by short-sellers -- and Wednesday, Oct. 24, was no different. 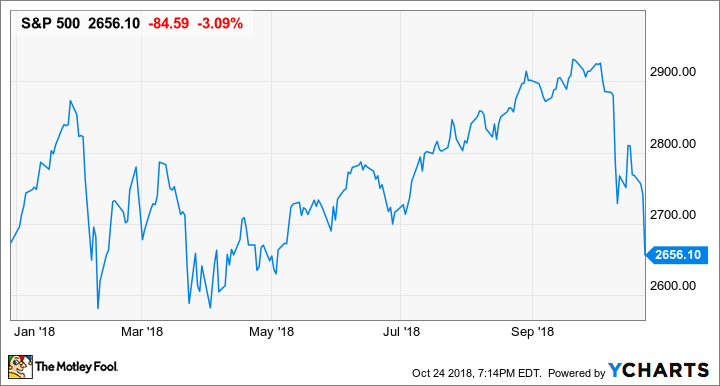 By the time the closing bell sounded on Wall Street, the iconic Dow Jones Industrial Average (DJINDICES:^DJI) had shed 608.01 points, the tech-heavy Nasdaq Composite (NASDAQINDEX:^IXIC) dove 329.14 points, and the broad-based S&P 500 (SNPINDEX:^GSPC) dipped 84.59 points. The 608-point decline in the Dow slots in as the 14th-largest single-day point drop in its more than 122-year history. The damage done to the S&P 500 was a bit worse, with the nearly 85-point tumble ranking sixth all-time, based on points. As for the Nasdaq, which really took it on the chin, the 329-point slide was its third-largest single-day point loss on record. Why is the stock market tumbling? The ongoing trade war between China and the U.S., which has increased the cost of aluminum, steel, and other goods in the U.S. and adversely impacted the bottom lines for certain (mostly manufacturing) industries. Rising interest rates, which could put the brakes on a fast-growing U.S. economy. Notable increases in wage inflation and a nearly 49-year low for the unemployment rate aren't helping ease rate-hike concerns. President Trump's criticisms of the way the Federal Reserve is handling its application of monetary policy. The more Trump discredits the Fed, the more Wall Street will, as well. Profit warnings from industry leaders. Most recently, this included disappointing outlooks from heavy-duty machinery manufacturer Caterpillar and stationery/adhesive kingpin 3M. Uncertainty surrounding the upcoming midterm elections. Should the Democrats win one or both houses of Congress, it'd be safe to presume that legislation would become even tougher to pass. That has growth-focused investors concerned. Whatever the reasons, yesterday's closing values place the Nasdaq well into correction territory (a 10% or greater drop from a recent high), with the S&P 500 on the cusp of a correction and the Dow not too far behind. As you can imagine, the latest swoon in the market has investors on edge, with potentially months or years of paper profits disappearing in a matter of weeks. For some, the more than halving the stock market underwent during the Great Recession a decade ago is also still fresh in their minds. Yet, for all the fear currently present on Wall Street and among investors, visual evidence exists that proves this fear irrational. If you don't believe me, prepare to be amazed. According to data aggregated by market analytics firm Yardeni Research, the S&P 500 has undergone 36 corrections of at least 10% since the beginning of 1950 (perhaps soon to be 37). That's about one correction every 1.9 years, which demonstrates just how common "swoons" in the market actually are. When we look at these corrections over a relatively short time frame, they do, indeed, look daunting. Here's a year-to-date chart of the S&P 500, highlighting the late January/early February decline, and the most recent October decline. This is what the Great Recession looked like to investors, from the S&P 500's peak in October 2007 at more than 1,500, to its trough at 676.53 points during March 2009. And here's the S&P 500 between Oct. 9, 1987 and Dec. 9, 1987, which includes the single-largest one-day percentage decline in the stock market (Black Monday) on Oct. 19. On this day, the S&P 500 registered a decline of 20.47%, which is still far and away its biggest one-day percentage loss in history. Now, let's switch up the parameters a bit. Rather than focusing on these short-term swoons, let's look at the long-term performance of the S&P 500 since the beginning of 1987. Image source: YCharts. Yellow highlights added by author to represent previously discussed corrections. Note the yellow highlights in the above chart? Those represent Black Monday in 1987, the Great Recession -- where the S&P 500 lost 57% of its value -- and the two most recent corrections in the S&P 500. Notice anything? 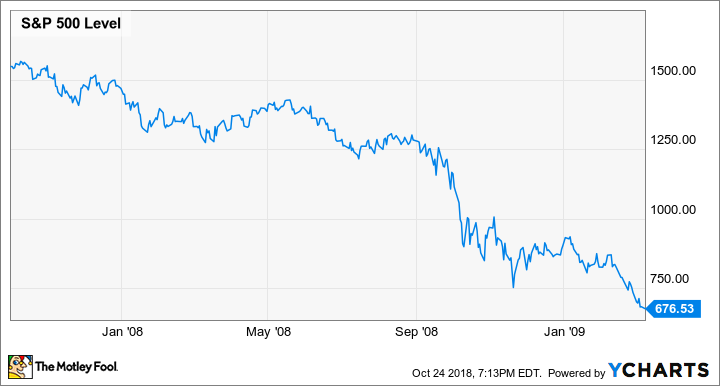 How about that the single-largest percentage decline in the history of the U.S. stock market now looks like nothing more than a blip on the long-term chart. Even the Great Recession, which was the most violent downdraft in stocks in seven decades, looks rather mundane over a 31-plus-year period. The point is this: Over time, high-quality stocks increase in value, and stock markets rise. Each and every one of the previous 36 stock market corrections in the S&P 500 has eventually been erased by a bull market rally. And in many instances, this happens within a span of months rather than multiple years. In short, as long as you have a long-term investing time frame, you have nothing to fear from a stock market correction.